Despite having the sort of hair that should respond well to serum - thick, wavy and prone to dryness (especially now I’ve started to lighten it), along with a few flyaways and a bit of frizz on a bad day – I just never got along well with this product. I couldn’t see the point. Hairdresser after hairdresser recommended it, I read rave reviews, my friends told me wonderful things, and yet, on my hair, serum just had no impact whatsoever. I never got what all the fuss was about. Then one day, roughly a year ago, that all changed. My friend Eleanor and I were visiting another friend, Lola, and staying overnight. Elle had forgotten her hair serum and borrowed Lola’s, which was my cue to launch into the whole never-works-on-my-hair sob story, while Eleanor worked the product through her chin length hair. Ok, so Elle is far too lovely to have said that last bit, but she might have thought it, and it’s certainly how I felt. But since that lightbulb moment, I’ve never looked back and have worked my way through bottles of MOMO Moisturizing Curl Enhancing Serum, John Frieda Frizz Ease and Toni & Guy Tame-it. They’ve all worked pretty well (as soon as I started applying enough product), and been effective in defrizzing my mane and coaxing it into some semblance of a style. 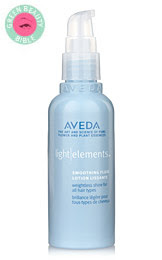 But my favourite product in this category has to be the Aveda Light Elements Smoothing Fluid (pictured above), that I’m using at the moment. I bought this in Brown Thomas a while back and, while I don’t remember the exact cost, it would have been towards the pricier end of the spectrum compared to the other products I’ve listed. But this colourless, lavender scented product delivers great results, so in my eyes it’s worth it: it leaves my hair shiny and smooth with softly defined, frizz free waves. I comb it through while my hair is wet but sometimes add just a tiny drop to dry hair too, to tame any stubborn flyaways and add extra shine. You can pick this up from Brown Thomas, salons like Whetstone or the Aveda website (where it’s priced at £20.50 for 100ml). great post, i'm always looking for new hair tips! Am serum devotee and I think it should be dispensed in public restrooms like hand gel. John Frieda works if you use it before even towel drying your hair but that takes a lot of self control. I really liked Aveda too - after buying it on one of those days when you'd buy anything - usually the days when you eat a whole tub of Ben & Jerrys and snap at people. I got a free skin brightening with it as I recall. Oooh...think this might work well on my hair. Thanks Emma!